Pineapple, one of the well-known fruits in Hawaii. When one pictures the ideal Hawaii vacation, it usually includes beaches, sunshine, drinks and delicious foods. Although Hawaii has many great restaurants, you can get some of the best foods right off the trees or vines. Sampling some of the locally grown tropical fruits will certainly add flavor to your vacation. Whether you get them at a farmers’ market or pick them on farm tours, there are no other better ways to enjoy tropical fruits in Hawaii. These spikey fruits have red, green, purple or magenta exteriors with white flesh and black seeds. The dynamic coloring makes it a favorite garnish for dishes at upscale restaurants and in fruit salads. Low in calories and high in vitamins, dragon fruits are an excellent addition to any meal. 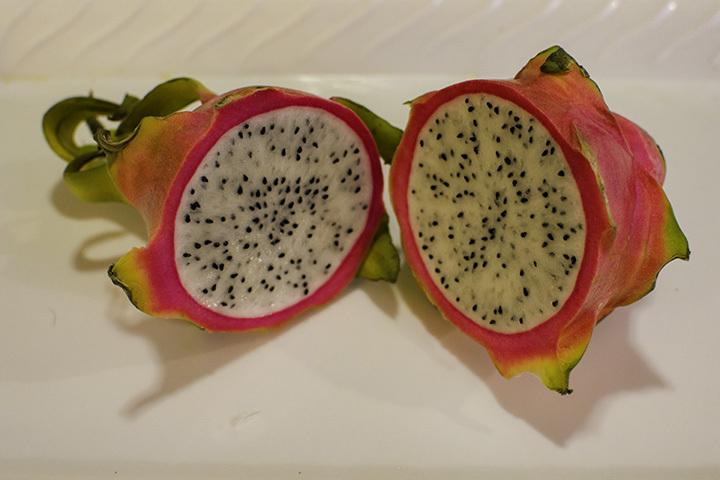 For die-hard dragon fruit fans, the Kona Dragon Fruit Farm on the Big Island is a must-visit. The banana is a timeless classic, growing in a peak season from June to October. In ancient Hawaii, the kapu system prohibited women from eating this sweet fruit. Although there are a number of varieties in Hawaii, the tart apple banana is the favorite choice among local people. It is the best kind of banana for drying since its color doesn’t change when dehydrated. It is definitely one of most popular fruits in Hawaii. Ever since James Drummond Dole established a successful plantation in the early 1900s, the pineapple is one of the most iconic fruits in Hawaii. Some popular varieties are the smooth cayenne, the Hilo and the Kona sugarloaf, which famous for its distinctive sweet flavor. At one time, Hawaii was the leading producer of pineapples in the world. Big corporations like Dole and Del Monte had large processing and canning operations in Hawaii. 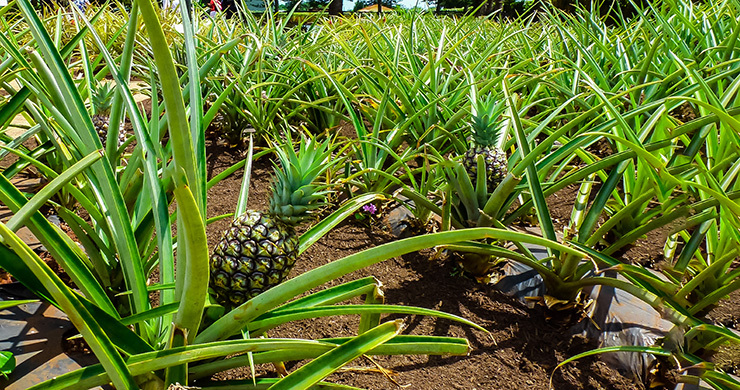 Today, companies still grow pineapples in Hawaii, but only for the fresh fruit market. As in most tropical environments, the ancient Hawaiians used coconut as a traditional staple. In Hawaii, people use coconut not only for its raw meat and dried chips, but also for its nutritious milk and copra. Locals make haupia from coconut and many places serve it along with traditional Hawaiian dishes. You can find this fruit tree in many residential front yards in Hawaii. Fresh mango has always been a popular snack or dessert in the Aloha State. The two most commonly found types of mangoes in Hawaii are the haden and the pierie. Besides eating them raw, you can enjoy mangoes in dried and preserved forms or as flavorings in syrups, chutneys and salsas. The guava is one of healthiest fruits in Hawaii. It’s full of fiber, potassium, vitamin A and has nearly four times as much vitamin C than an orange. One can find guavas trees in backyards, in the forests or in small farms. As they have an abundance of small seeds, most people in Hawaii enjoy guava in the form of juices, jams and jellies. This starchy fruit often accompanies main dishes as a sweet side order with savory meats. Cook it and then eat it like a potato. 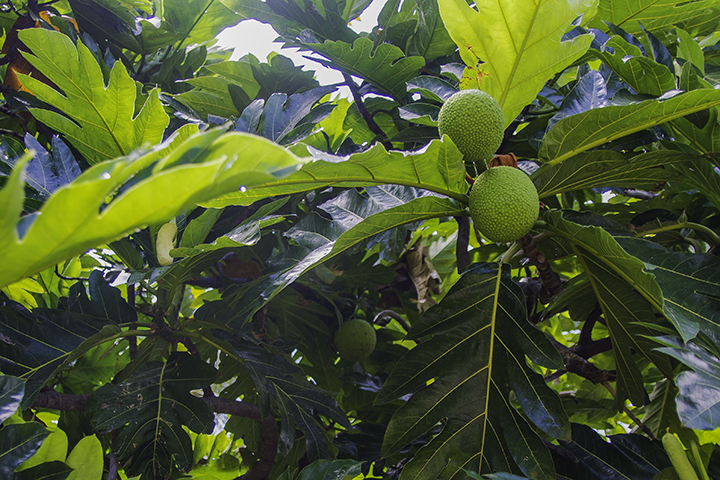 You can find breadfruit trees throughout Polynesia and the fruit is a traditional staple in Samoan culture. The lillikoi or passion fruit is arguably one of the most favorite types of juices in the Aloha State. Local people often use it as a key ingredient in many dessert recipes. Additionally, some even use lilikoi in syrups, sauces, jellies and jams. As in the case with guavas, the lilikoi fruit has an abundance of small seeds. So it’s often better to consume it in juice or preserved forms. Most eat papaya in salads, as a side to main courses or by itself seasoned with fresh lime juice. This fruit also has medicinal values that aid in digestion. Some even use it as a topical ointment for rashes and burns. The starfruit or carambola has a distinctly unique star shaped figure. The meat of the starfruit contains vitamin C, potassium and is relatively low in sugar. However, because the acids in the fruit, those with kidney stones or kidney disease should avoid it. Because of its unique shape, people use the starfruit as a garnish or as a decorative side. It’s a must-have on any tropical fruit list. While red in color, it’s really not an apple nor does it look like one. Unlike regular apples, it does not have a crunchy feel when you bite into it. Instead, it has a softer but still very succulent sweet taste. Mountain apples are from the syzygium family of flowering trees and the Hawaiian name of this fruit is ōhiʻa ʻai. 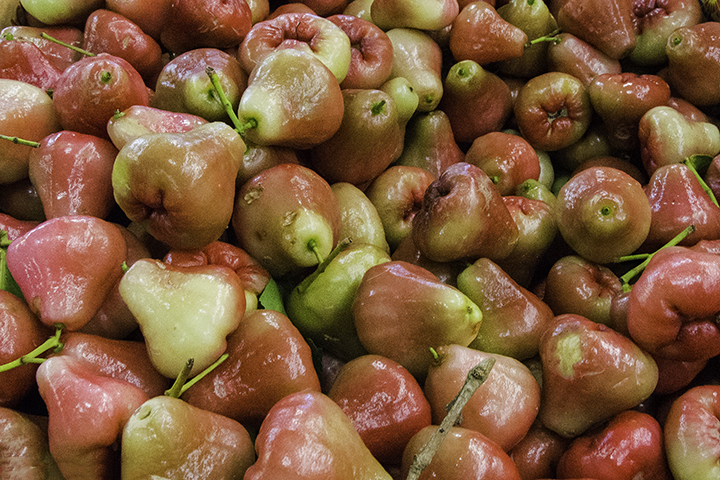 Historians refer to the mountain apple as a canoe plant as the Polynesians originally brought it to Hawaii by canoe. This fruit tree came to Hawaii in the late 1800s from China. It was then a very popular fruit tree and continues to be enjoyed by many in Hawaii today. While some lychee is commercially produced, the vast majority is grown in local backyards. The plant bears the best and most fruit in wet weather conditions. The fruit has a leathery but relatively thin red skin. Inside, it has a silky, translucent white color with an oval black seed in it. Lychee is very sweet, succulent and delicious.